The enormous growth in the field of biotechnology necessitates the utilization of information technology for the management, flow and organization of data. The field continues to evolve with the development of new applications to fit the needs of the biomedicine. From molecular imaging to healthcare knowledge management, the storage, access and analysis of data contributes significantly to biomedical research and practice. All biomedical professionals can benefit from a greater understanding of how data can be efficiently managed and utilized through data compression, modelling, processing, registration, visualization, communication, and large-scale biological computing. 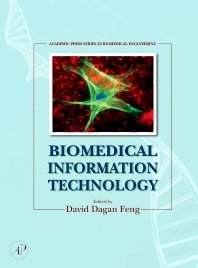 In addition Biomedical Information Technology contains practical integrated clinical applications for disease detection, diagnosis, surgery, therapy, and biomedical knowledge discovery, including the latest advances in the field, such as ubiquitous M-Health systems and molecular imaging applications. biomedical and clinical engineers; physicians and surgeons; health physicists; bioinformaticists; biomedical researchers, students, educators; members of the basic science community; IT specialists, healthcare professionals and researchers. Professor David Dagan Feng is Founder and Director, Biomedical and Multimedia Information Technology (BMIT) Research Group, Funding Director, Institute of Biomedical Engineering & Technology (BMET), and Funding Head, School of Information Technology (recently renamed as School of Computer Science), the University of Sydney (USYD), as well as Academic Director, USYD-SJTU (Shanghai Jiao Tong University) Joint Research Alliance. He has been, Head of Department of Computer Science and Associate Dean, Faculty of Science, the University of Sydney; Honorary Research Consultant, Royal Prince Alfred Hospital, the largest hospital in Australia; Chair Professor of Information Technology, Hong Kong Polytechnic University; Scientific Advisor, the 3D Anatomical Human European Institute / Project involving 7 countries; Advisory Professor, Chief Scientist and Chair of the International Advisory Committee, Med-X Research Institute, Shanghai Jiao Tong University; Guest Professor for a number of universities, including Tsinghua University. He received his M.E. in Electrical Engineering & Computer Science (EECS) from Shanghai Jiao Tong University in 1982, M.Sc. in Biocybernetics and Ph.D. in Computer Science from the University of California, Los Angeles (UCLA) in 1985 and 1988, respectively, where he received the Crump Prize for Excellence in Medical Engineering. In conjunction with his team members and students, he has been responsible for more than 50 key research projects, published over 900 scholarly research papers, pioneered several new research directions, and made a number of landmark contributions in his field. He has served as Chair of the International Federation of Automatic Control (IFAC) Technical Committee on Biological and Medical Systems, Special Area Editor / Associate Editor / Editorial Board Member for a dozen of core journals in his area, and Scientific Advisor for a number of prestigious organizations. He has been invited to give over 100 keynote presentations in 23 countries and regions, and has organized / chaired over 100 major international conferences / symposia / workshops. Professor Feng is Fellow of ACS, HKIE, IET, IEEE, and Australian Academy of Technological Sciences and Engineering.